The Boulder City swim teams are in the new Division 1-A region this season and finding competition in dual meets did not appear likely, especially for the two-time defending state champion boys team. So coach Sara Carroll went out and scheduled some of the top Division I teams, teams the Eagles beat the past two seasons for state titles before realignment. But even perennial power Palo Verde was no match for Boulder City on Saturday as the boys defeated Palo Verde, 192-108, while the girls won, 175-118. The next test is state power Green Valley. Both Boulder City teams will compete against the Gators at 8:15 a.m. on Saturday at Multi-Generational Pool. Against Palo Verde, it was the usual dominance. In the boys’ competition, Estes won the 200 freestyle in 1 minute, 48.49 seconds and the 100 freestyle (47.01), while sophomore teammate Sam Sauerbrei won the 200 individual medley in a time of 2:02.56 and the 100 butterfly (54.02). Junior Joey Gebhart won the 50 freestyle (22.38) and the 100 backstroke (55.81). Junior Jared Smith won the 500 freestyle (4:50.18) and senior Gunner Braden won the 100 breaststroke (1:02.27). In the relays, the Eagles won the 200 medley relay (1:40.01), the 200 free relay (1:31.08) and the 400 freestyle relay (3:21.55). In the girls’ competition, sophomore Alex Hubel won the 200 freestyle (1:54.81) and the 50 freestyle (24.84), while freshman Becca Lelles won the 200 individual medley (2:16.27) and the 100 breaststroke (1:11.55). In the relays, the Lady Eagles won the 200 medley (1:52.55), the 200 freestyle (1:44.14) and the 400 freestyle (3:43.46). Freshman Charlene Masterson pitched a shutout as the Eagles avenged their only Sunrise League loss of the season with a 2-0 victory at home April 19 against Chaparral. Chaparral had beaten Boulder City, 4-3, on March 22. Masterson allowed seven hits, struck out 11 and walked one. Senior Kasey Ochoa’s RBI double in the bottom of the sixth inning broke the scoreless tie. The Lady Eagles added another run on a Cowboys’ error. 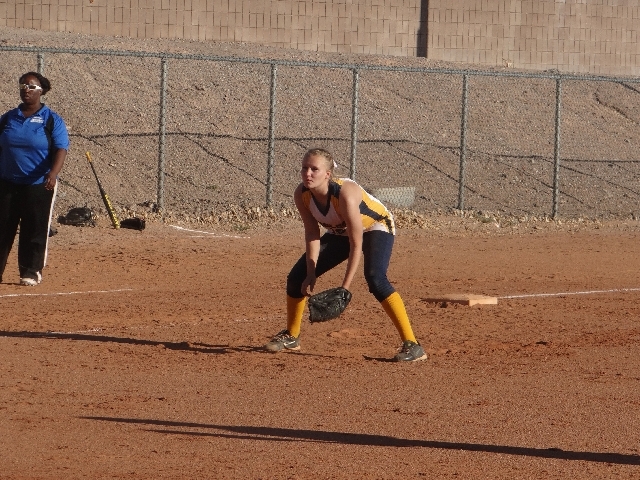 On April 18, the visiting Lady Eagles defeated Del Sol, 13-3, in a nonleague game. Sophomore Jessica Embro went 2-for-3 with a double as the Lady Eagles used a nine-run second-inning to win in five innings. Sophomore Alyssa Ybarra was 1-for-2 with a double. On Tuesday, sophomore Mikaela Brown threw a five-inning perfect game, striking out 11 in the Lady Eagles 23-0 win at Desert Pines (0-15 overall, 0-10 Sunrise League). Boulder City (22-6, 8-1) holds a two-game lead in the Sunrise League heading into the last week of the regular season. The Lady Eagles host Moapa Valley (10-10-1, 6-3) today at 3:30 p.m., then host Foothill (19-12) in a nonleague game Friday at 7 p.m.
Boulder City then hosts Tech (14-13, 6-3) Monday and ends the regular season at Sunrise Mountain (9-12, 4-5) Wednesday. Both games are at 3:30 p.m. The Lady Eagles will likely host a 1-A Southern Region playoff game May 6 at 4 p.m. Junior Chandler Harkins won three individual events to lead the Eagles to a 114-32 dual-meet win at home against Virgin Valley on April 17. He won the 800 meters in 2 minutes, 14.5 seconds, the 1,600 meters (4:48.4) and the 3,200 meters (10:39.0). Junior Xavier Steel added wins in the 100 (11.4) and 200 (23.7), while junior Jacorey Dixon won the 400 (54.0) and 110 hurdles (15.9). Senior Christian Nilsen won the shot put (44 feet, 6 inches) and discus (134-3). (3:47.8) and 3,200 relay (10:42.9). Senior Tanner Imlay won the triple jump (39-2). In the girls meet, junior Jana Williams won the 100 hurdles (18.3) and 300 hurdles (50.6) to lead the Lady Eagles to a 91-51 victory. Freshmen Emma Jeppsen won the 400 (1:05.8), while sister senior Eliza Jeppsen won the 800 (3:01.2). Freshman Emmalee Torgeson won the 1,600 (6:38.9) and 3,200 (14:45.2). (4:37.8) and 3,200 relay (12:26.2). Sophomore Alexis Fenyves won the triple jump (31-0) and junior Whitney Barlow won the shot put (32-5), while senior Emilia Oscilowicz won the discus (97-11). Boulder City won a few titles at the Division 1-A Frosh-Soph Championships held Friday in Overton. The boys team finished third with sophomore Brooks Roe winning the 110 hurdles (17.87) and 300 hurdles (45.14). Sophomore Garrett Meyer won the 3,200 (11:03.12). The girls team finished fifth in the 11-team event, but had no individual event winners. The Eagles golf team continues to score below 400 and in the range their coach thinks they will need to compete for a state title. On April 18, sophomore Luke Logan shot a 1-under par 71 and medalist honors to lead the team to a Sunrise League win. Sophomore Christian Hudleson (71) finished second, and senior T.J. Hatfield (74) grabbed third. Junior Kyle Effertz (81), senior Tyler Barton (83) and senior R.J. Mortensen (83) also played, but only the top five went toward the team’s 381 score. Needles finished second at 436. The Eagles had another Sunrise match Wednesday at Coyote Springs. The team will face Green Valley in a dual match Monday at Legacy, before the final Sunrise match May 2 at Las Vegas National. “If we do the small things from here on out, we should be right there when it comes to the postseason,” Quintero said.